I've always loved carrot cake – it's the ultimate fall/winter treat! 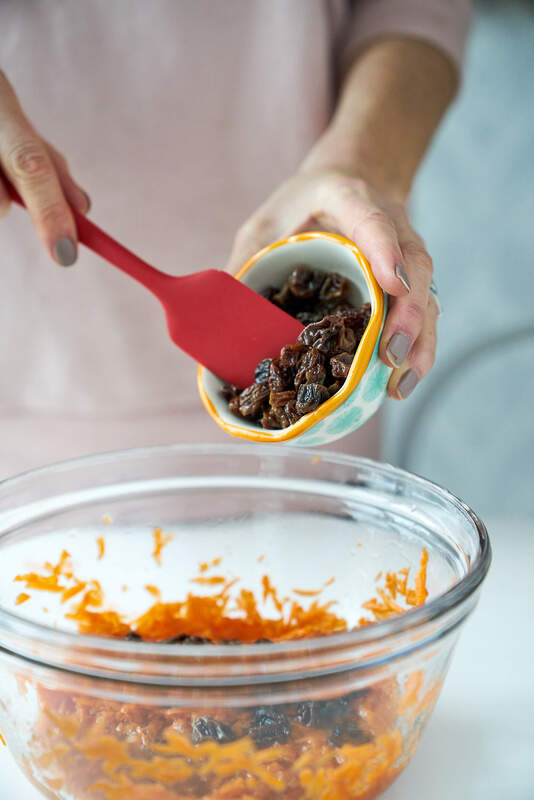 If you read my first cookbook, Joyous Health, you likely know that for several years at Christmas gatherings, I used to make a triple decker carrot cake with cream cheese icing and loads – no, wait – like BUCKETS of sugar! I baked all the freakin' time, but not the healthy kind of baking like I do now. It was incredibly decadent and the furthest thing from good for you. So when I created the recipes for my first cookbook Joyous Health, I created these Raw Carrot Cake balls which are easily the most popular recipe from that book (next to my Black Bean Chia Brownies). Why? Well, it looks like you guys are a bunch of carrot cake lovers too! 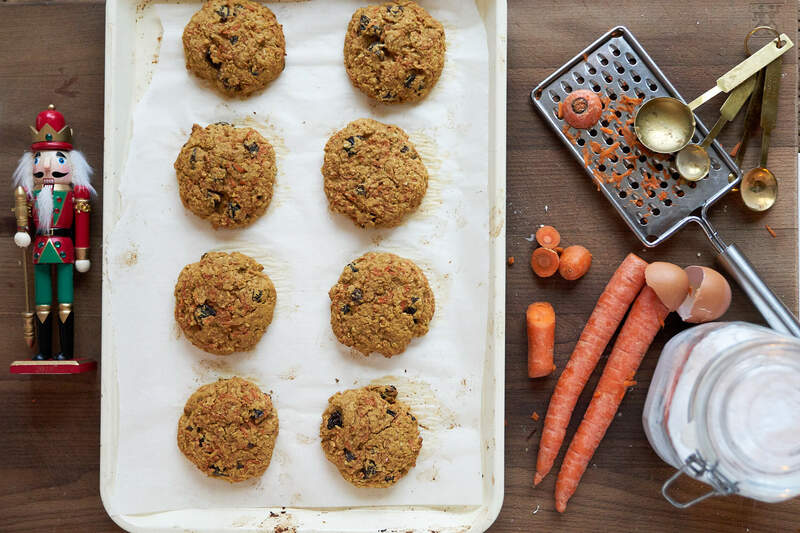 I've been meaning to create an oven-baked carrot cake cookie for a long time but I've been busy in the kitchen whipping up Cranberry Walnut Breakfast Muffins, Rise & Shine Lattes, Harvest Veggie Soup on the blog and so many more recipes! I'm really excited to share this brand new recipe with you guys because these cookies are amazing! 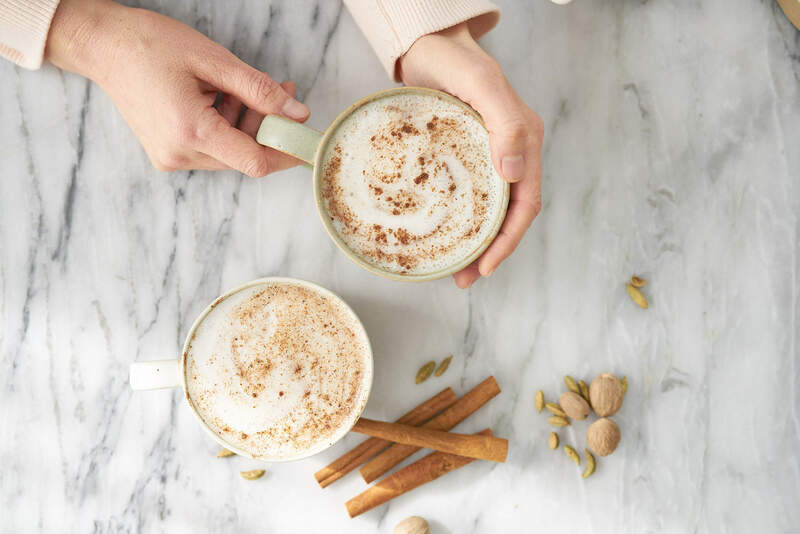 They are soft, fluffy, fulfilling and the blend of ginger, cinnamon and nutmeg together are pure bliss. 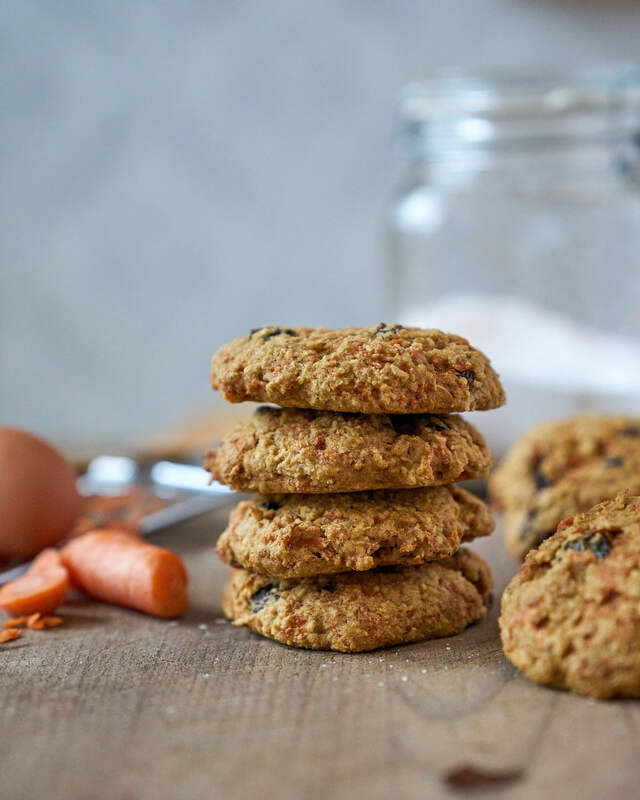 Originally I was going to call them Carrot Raisin Coconut Cookies but then I ate one and I was like, "this tastes like carrot cake", except they are better for you than carrot cake because there's zero refined sugar in them. They are also gluten-free and dairy-free! 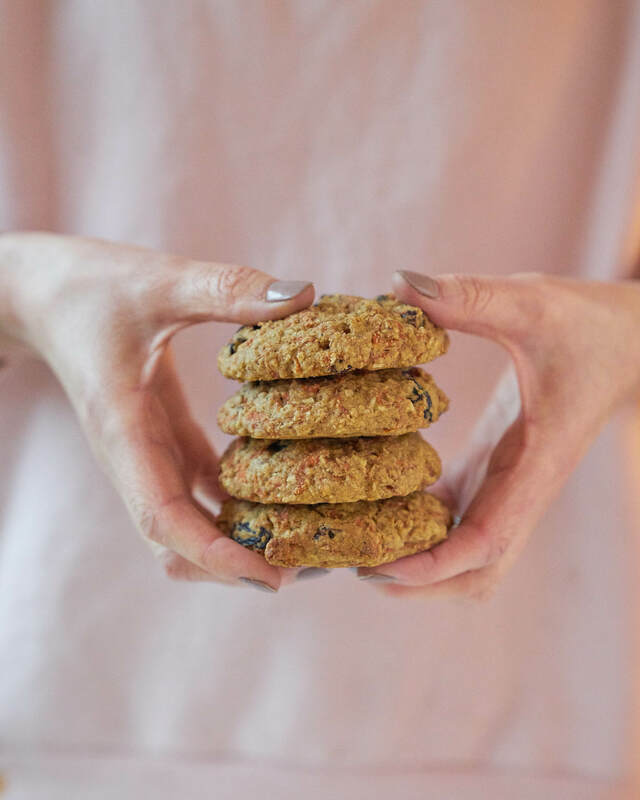 You could totally have one for breakfast (just like my Good-Day Breakfast Cookies ) with a green smoothie because they are rich in fibre from the carrots, shredded coconut, raisins and brown rice flour (instead of white flour, which is void of nutrients). These cookies also go PERFECT with a Rise and Shine Latte – that sounds like a Sunday afternoon tea party if you ask me :)! I recommend you use organic carrots so you don't need to peel them. 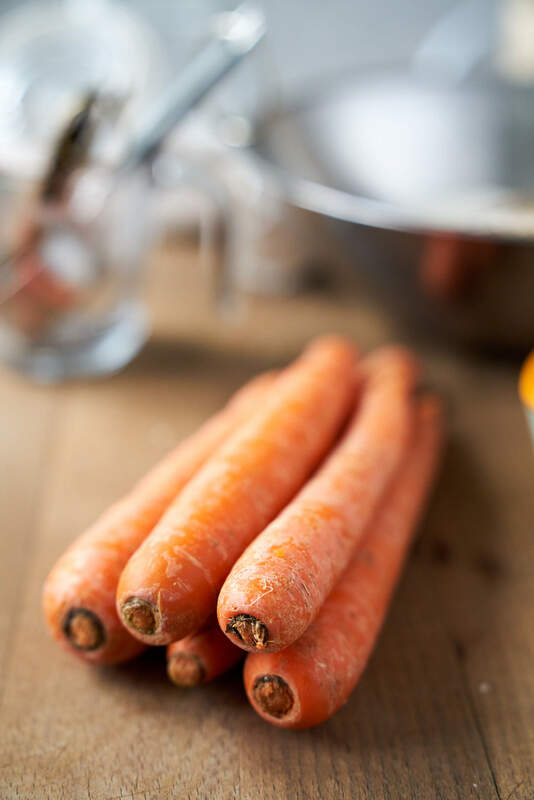 Plus, the price difference between conventional and organic carrots is often quite minimal so it's not too much of a financial leap to get them instead. Just give them a good scrub and grate them. While I love my mighty awesome food processor (which is #JoyousHealthApproved by the way), I didn't want to use it while Vienna was napping since it can be quite loud (as food processors often are). So I went old school and grated the carrots by hand. 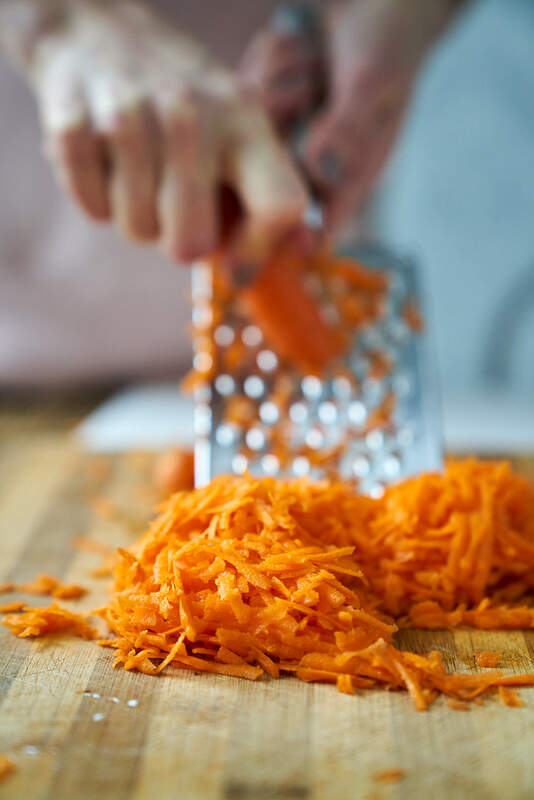 It may take a bit longer, but shouldn't take more than 5 minutes because this recipe only calls for a cup and a half of shredded carrot. 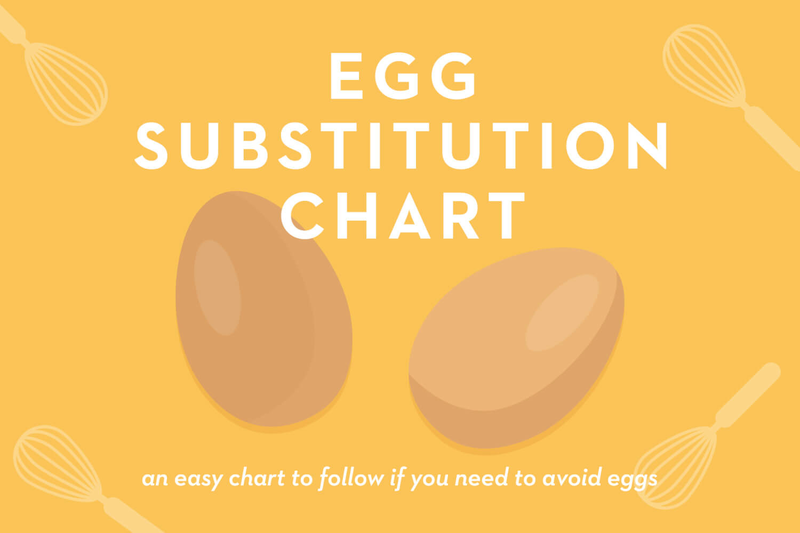 If you don't eat eggs, I am pretty confident these will work with an "egg replacer" like a chia or flax egg, especially since I only used one egg. The other swap you can do if you don't like raisins is use unsweetened cranberries. Those would be equally as lovely! If you really wanted to make them special, they'd be lovely with an icing on top too. YUM!! Preheat oven to 350F (180C). Grease cookie sheet with coconut oil or place parchment paper on top of cookie sheet. In a large bowl, combine brown rice flour, shredded coconut, baking powder, baking soda, ground ginger, cinnamon and nutmeg. 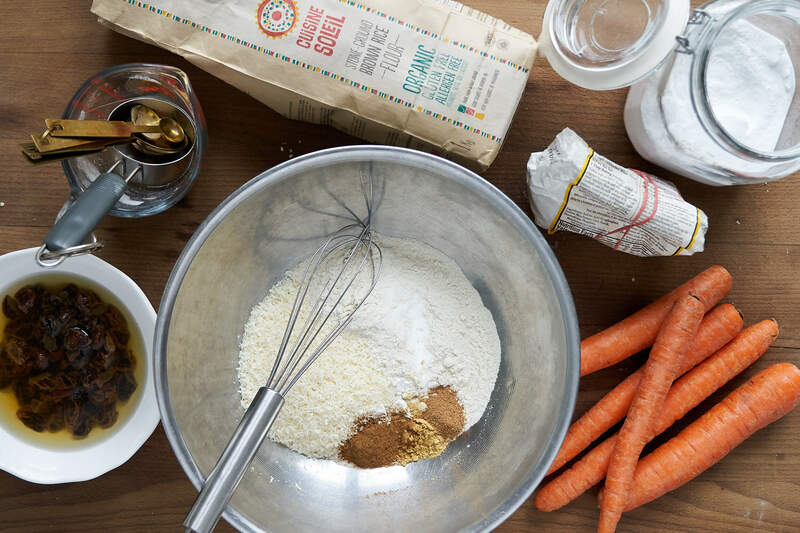 In a medium bowl, combine carrots, whisked egg, maple syrup, coconut oil and raisins. Make a well in the centre of the dry ingredients and pour the wet ingredients (carrot mixture) into the dry. Mix together until well combined. To make large cookies, using your hands, form the mixture into approximately 2" inch balls and flatten on to cookie sheet with your hands. Bake for 10-15 minutes until golden. Remove from oven and let cool on sheet for 5 minutes. Remove from cookie sheet and place on cooling rack to cool completely. Store in the fridge for up to a week or in the freezer for up to 3 months in a freezer bag. Makes 10 large cookies or 20 small ones. I've made these with a little less than 1/2 cup maple syrup and they still taste nice and sweet. I am smiling ear to ear because I'm so happy with how these cookies turned out! You're gonna love them and if you have any holiday cookie exchanges coming up, these cookies will be perfect for them! 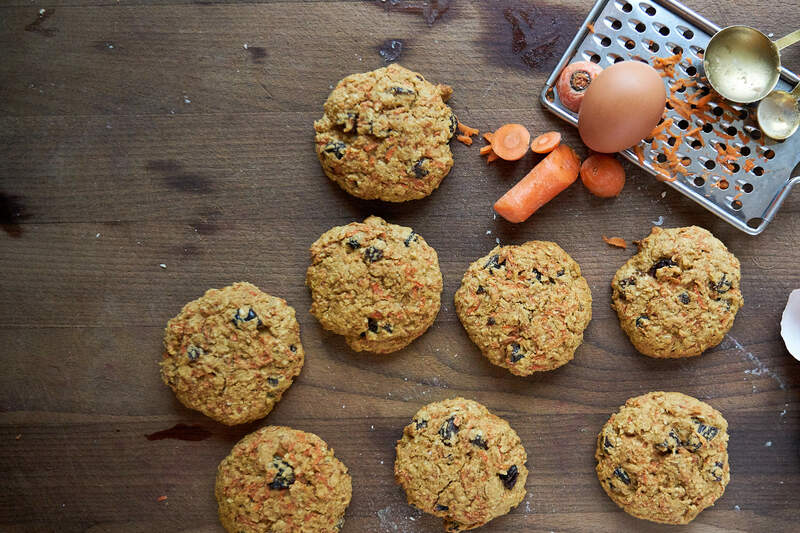 Planning on making these Carrot Cake Cookies? Tag me @joyoushealth on social media so I can see them! What other type of flour can I use instead of brown rice flour? You could try spelt flour, but that has gluten as long as you're okay with it. I also really love buckwheat flour and it's GF. Good luck! Wht could be a good sub for brown rice flour ?? I can’t use it.. can oat flour or spelt flour work ?? I think both of those would work. If you try, please let me know because then I can let other people know! Avoiding sugar in baking including fruit, would 1/2 cup non dairy milk be a substitute? Look yummy!! Can’t wait to try. Thank you. I Know what I’m doing this Sunday! Mmm can’t wait! I just made these using 1 cup whole spelt flour instead of brown rice flour - delicious! I increased the cooking time by a couple of minutes and pressed them quite flat. I'm munching on one now while it is still warm. Thanks, Joy! You're most welcome! Glad you loved them Victoria! Any idea where I can find unsweetened dried cranberries? Have looked at the Sweet Potato and Organic Garage-bulk and shelf brands. All still sweetened with Apple juice if unsweetened rather than cane sugar sweetened. Beginning to think they don't exist! Would love them in these cookies and the cranberry walnut muffins! I wouldn't worry so much if it's at least sweetened with apple juice. I've bought those ones from the Sweet Potato before and I don't find them overly sweet. I mean you could use frozen cranberries which wouldn't be sweetened? Ok thank you! Still on the hunt for unsweetened. Did use fresh in the muffins and put some in the freezer for the future! Fresh were excellent. Will be making these cookies this weekend! Thank you and looking forward to your new book. Hurry up! You're welcome! Glad the muffins turned out great! I made these last night with oat flour and added a little extra oat flour to help thicken it up and they turned out great! I'll have to pick up some rice flour for the next time I make them. My kids and husband loved the cookies. I'm thinking we'll leave a plate for santa on Christmas Eve! Thank you Joy, you are the best! Will this work with almond flour as I do not eat rice (or grains). Hi Joy! I made them with oat flour as well, just added a bit more. I also added another egg as mine were quite small free run eggs. I knew it may be too much liquid but I tried it anyways. I realized when you said you should be able to form the dough in your hands mine was not nearly of that consistency. I was afraid if I added too much flour I might ruin the taste and texture. So I decided to scoop into muffins tins. They were delicious as a muffin! Moist and great flavour. Just made these. Our new favourite cookies! We only used 1/4 cup of maple syrup (that’s all we had) and they were perfect!! Thanks fir such a great guilt-free recipe. Hi Bev, glad to hear they are your new favourite cookies! shredded coconut means grated fresh coconut or desiccated coconut? Any maple syrup brand that you recoment and i can find in california? I would suggest visiting your local health food store and making sure it is 100% pure maple syrup with no other sugars or syrups in it. You can't really go wrong if you buy the real stuff! My 3 year old son, who is a very picky eater, doesn’t eat vegetables. The only way is feed it to him in cookies. I was hoping he wouldn’t think the texture was to close to cake. He really likes these cookies. First carrots he has had in 2 years. Yay! That's a huge success that you got your son to eat some veggies :) Thanks for the comment. I tried this recipe today. Yum. Great recipe! Thanks Grace! Glad you love it! So very many years ago I made a dessert called Inside Out Carrot Cake Cookies. They had a cakey texture, like these seem to have, and they were sandwiched together with a slather of cream cheese whipped with honey. They were divine. I'm thinking of doing the same with these! As an alternative to cream cheese, traditional for carrot cake, I also thought about using a mild goat cheese. That sounds delicious!! You know I totally thought about stuffing these with coconut butter (maybe I mentioned that in the post) but you reminded me to do that! Goat cheese is a GREAT idea! Mix it with a bit of raw honey maybe? I like where this is going! My 16 month old loves these! I added flax and am considering adding Collagen powder... do you think that would be ok for a 16 month old? Or make a separate batch for me? I made these last night and they were very tasty. I used I cup of regular AP flour (as I couldn't find brown rice flour) and found that the cookies had a muffin like texture. I obviously didn't read your flour substitution and should have used 3 cups of regular flour. When I make them again on Wednesday (in prep for my son's school Easter party), I'll use three cups of AP flour. Thanks so much for this yummy recipe. You're welcome! You'll definitely get more rise out of AP flour than brown rice flour which is dense.